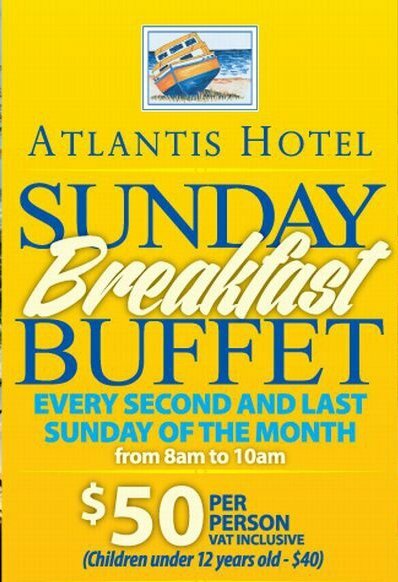 In addition to its famous Sunday Buffet Lunch served every Sunday, Atlantis Hotel are now offering, on the second and last Sunday of every month, a special Sunday Buffet Breakfast from 8-10am. Cost BB$50 for adults and BB$40 for children under 12. 'We get the sun first everyday... but we love sharing'. Come and enjoy an early Sunday morning gazing out at the rugged beauty of the East Coast while you enjoy the Sunday Buffet Breakfast. The spread includes fresh fruit salad, bacon and eggs, Pork sausage, fried flying fish, grilled tomatoes, sautéed potatoes, baked beans, banana bread, coconut bread, bul jol and bakes, fresh coffee, and a selection of juices.